Happy Mardi Gras! But that's not the only thing special about this Tuesday--which means it's also #muckedup day! Got a relevant question for the group to tackle? Tweet it to our moderator, and then join the chat at 5 p.m. PST/8 p.m. EST by tweeting with and following the #muckedup hashtag! And on today's Muck Rack blog: the 5 links we loved in January. "El Bloombito 2016!!!!!" tweets Talking Points Memo's Catherine Thompson of the news that Michael Bloomberg is eyeing a 2016 run for the White House (at about 2,500+ shares currently). "On eve of primary where Sanders and Trump are favored to win, Bloomberg acknowledges thinking of running," observes NYT's Maggie Haberman. "It's happening. Maybe," summarizes Justin Ocean at (you guessed it) Bloomberg Pursuits. 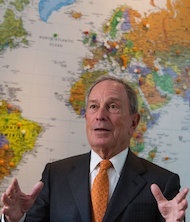 "Can Bloomberg just enter the 2016 race or leave already?" pleads Adrian Arizmendi at AJ+. And what was it that brought Bloomberg to this point? He called the "discourse" in the 2016 presidential race "an outrage and an insult to the voters." At the New York Daily News, Josh Greenman reacts, "There's a lot you can say about the level of debate in this election, but 'distressingly banal' is not one of them." Similarly, Texas Tribune's Evan Smith muses, "Yeah he’ll play well among the common people." Although Quartz's Steve LeVine is quick to point out, "If Bloomberg runs, it would be uncharacteristic of him to be last-minute as it would be now. So maybe in 2020." Also trending in politics, NYT's resident conservative David Brooks just admitted he's going to miss Barack Obama. 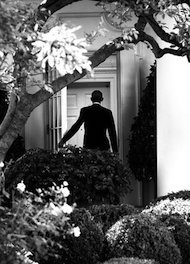 But here's why: "Obamas have not only displayed superior integrity, they've hired people w/high personal standards," Brooks argues. "So has @nytdavidbrooks been excommunicated from the GOP & the brotherhood of the center-right yet?" wonders freelance journalist Jill Lawrence. It won't help Obama get his latest budget passed by a Republican Congress, of course, but it's hard not to contrast Obama's calm with the anxiety of being Marco Rubio. "The n-n-nerves that made #Florida Man @marcorubio act like a robot on TV also responsible for rapid political rise," notes Craig Pittman at the Tampa Bay Times. He's talking about Rubio's habit of inexplicably repeating a scripted line word for word, by the way. "Rubio 2.0 still buggy, plz get the product team on this," jokes Timothy Burke with Deadspin. But don't even think about dressing up like a robot at a Rubio rally, or you'll end up manhandled by Team Marco. Also, that woman whose lewd comment was gleefully quoted by Trump offers equally lewd but positive commentary on Trump himself. Thankfully, we have The Onion to make up for the lack of recent Jeb Bush coverage. Our last question asked: Betty White is trending everywhere today after proving during the Super Bowl opening that she can do what? By proving that she can dab with the best of them. Congratulations to Eugene Hunt for being the very first to answer that correctly! Honorable mentions go out to these wonderful people for also answering correctly: Craig Pittman, David Daniel (who thinks Betty, rather than Beyoncé, got the "ultimate #SB50 mic drop"), Robin Tierney, Lucia A. Walinchus (who asks "But really is there anything @BettyMWhite can't do? "), Whitney Friedlander, Carey Bodenheimer, Charlotte LoBuono (who adds "Go Betty! Love her! "), Mark Gibbs (who admits he "didn't know "dabbing" 'til [Muck Rack] asked. Watched Rich the Kid how-to"), Fabiola Camacho (who adds "Her flawless dab clearly intimidated the panthers and we were left with yesterdays game"), Eve Byron, Lizzy Shaw, Waterfield Designs (who also admits "Before you asked, I had no idea what that was"), Kelsey Humphreys, David M. Parada, Miriam van Ommeren and Ron Casalotti (who quips "She proved the old Brylcream ad slogan: A little Dab'll do ya, stil gets attention"). Shout out to Margo Howard, who guessed "Walk. And maybe skip." As for today's question, here it is: A Florida man faces charges of assault with a deadly weapon after he threw what into a Wendy's? The LA Times welcomes Pedro Moura (at right) as Angels beat writer. 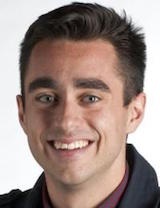 Moura joins from the OC Register, where he served as Angels and Dodgers reporter. Matt Drange soon joins Forbes as a staff writer in its San Francisco bureau, where he will cover tech, money and power. Drange currently covers guns for the Center for Investigative Reporting and has written for the Bay Citizen, the Times-Standard and The Osprey. Kevin Koenig is now the executive editor of Yachting Magazine. Koenig previously served as senior editor at Power & Motoryacht. Joshua Glass will be upped to managing editor at Essential Homme magazine. Glass is finishing up as associate editor there.